There are two main methods of growing Acacias: from seeds and from cuttings. 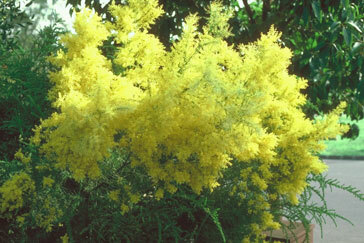 Growing Acacias from seeds is the easiest and quickest method of producing plants. One important factor to consider is the source of seed. Seed collected from a home, botanical or other garden where Acacia species from different climatic zones grow together in an unnatural combination provides the opportunity for the production of hybrid seed resulting in plants that may not be true to type. Seed Collection: Seed collected from natural bush areas would avoid this problem. A permit to collect would be required from State National Parks Authority or the land owner. Seed too may be obtained from a reliable native plant seed service which usually can guarantee the source and quality of the seed supplied. Acacia seeds ripen in the pods on the bush and are expelled which means a reliable method of collection needs to be used. If it is not feasible to be there at the right time, a cloth bag (not plastic) or nylon pantyhose may be placed over the ripening pods and tied. After collection pods should be discarded and the dried insect free seeds stored in airtight containers marked with date, place of collection and name. Propagation: It is recommended that all equipment and soil to be used (if not purchased commercially) be sterilised to prevent any possible contamination from soil pathogens or production of weeds. Propagation Units: 1. Simple equipment can be used to start growing from either seeds or cuttings. Clean plastic pots filled with the appropriate mix (see below) and covered with a plastic bag supported by curved wire. A tie or rubber band may be used to secure the plastic bag in place. 2. Small plastic propagation units are available from commercial sources or may be made. 3. Glass or ‘poly’ houses also are commercially available or may be built. An automatic misting system could be installed to maintain humidity. ‘Bottom heat’ too may be used to create warm conditions year round giving faster production of roots or germination of seeds. This is basically a protected heated pad which is placed in a frame or box covered by sand or gravel into which the pots are embedded. These ‘houses’ need to be covered in summer with shade cloth or painted with special white paint to control the heat. Seed and cutting mix. Seed mix may be purchased or mixed using 3 parts river sand (not beach) and 1 part well composted pine bark, peat moss or vermiculite. Cutting mix is similar but is usually coarser in texture using 3 parts gravel to 1 part pine bark. To both mixes a small amount of slow release native plant pellets may be added. To grow from seed use a freely draining seed mix placed in plastic containers or punnets. Acacia seeds need to be treated before sowing to enable moisture to penetrate the normally hard seed coat. One method is to place seeds in a container, cover with near boiling water and soak overnight. Seeds which swell are ready for sowing, the remainder may be re-treated. Another method is to scarify the seed. This is done by rubbing the seeds between two pieces of sandpaper thus thinning the seed coat to allow water to penetrate. If few seeds are to be sown it is possible (but normally difficult on account of the very hard seed coat) to nick the top of the seed away from the seed stalk with a sharp blade or needle without damaging the soft part of the seed. Seeds should be sown about 5 mm apart in prepared soil mix, lightly covered with mix to the depth of the seed or a little more, lightly pressed flat, watered and the containers placed in a semi-shaded site and kept above ground level or placed in a propagation unit. Soil should be kept moist but not wet. Germination can occur between a few days and a few weeks. Remember to label all pots with plant names and date of planting. Acacias may be propagated successfully from cuttings especially from those with smaller phyllodes (leaf like structures). It is usually recommended that cuttings be taken from half hardened wood and be about 5-15 cm long. Material taken from lateral growth and stem material hardening after flowering can be used for cuttings. The cutting should be cut below a node with sharp secateurs and the lower two thirds of the ‘leaves’ removed without tearing the bark. Reduce any large ‘leaves’ to about half their size or less to reduce water loss and stress. Remove any flowers or buds. Dip the base of the cutting in a rooting hormone, either liquid or powder and place cutting in plastic containers filled with cutting mix which has been lightly flattened. Make a hole with stick or pencil to take each cutting. Firm, water the pots before placing them under plastic, in a propagator or glass or ‘poly’ house. To strike cuttings of bipinnate (fern-like) foliaged Acacias is more difficult as the tiny leaflets tend to hold water and fall very quickly, thus spoiling the cutting. More experiments and trials need to be undertaken with this type of cutting to be consistently successful. Potting On: When seeds have germinated and the seedlings are large enough to handle (about 2-3 cm tall) they should be transplanted into prepared clean potting mix in 7 cm diameter plastic pots. Cuttings are ready to pot on when roots have developed. This can be observed by checking for roots protruding from the base of pots. Remove rooted cuttings by gently tipping the contents of the pot onto a plastic sheet and carefully removing the new plants and placing them each in a plastic pot half filled with potting mix, making sure that the roots are straight. If the roots have started to curl around or are too long for the new container, trim them back carefully with clean secateurs. Fill the pot with soil and firm. With both seedlings and cuttings firm the soil around the plants before watering. Place the pots in a shade house or shady area receiving only morning sunlight for one or two weeks to offset the shock of transplanting. After this time gradually introduce the new plants to sunlight. Water regularly to prevent drying out. Acacia plants should not be left in pots too long before planting in the garden as they quickly develop long root systems. Planting Out and Maintenance: To plant out in the garden select a well-drained spot, clear away any weeds or grass and dig a hole about twice the depth of the pot. Fill the hole twice with water allowing the water to drain away each time. To release the plant from the pot, hold a hand over the top and around the plant, knock the top of the pot on a firm surface and ease the plant out, Tease out the roots, straighten or trim any of those that are curled. Place the plant in the prepared hole planting to the previous soil level, hold the plant upright while the hole is filled with soil. Firm around the plant and water in. Continue to water about once a week until the new plant is established, especially if conditions are dry. The garden area could be mulched with pine bark or other available material to help prevent drying out but the mulch needs to be kept away from the plant stem to avoid the possible development of stem rot. Pruning is advisable each year to maintain a bushy healthy shrub. This is best undertaken after flowering. Australian Plants 22(180): 291-334 (2004) and 25(203): 243-290 (2010). These volumes contain a number of useful articles dealing with cultivars and the cultivation of Australian Acacias. 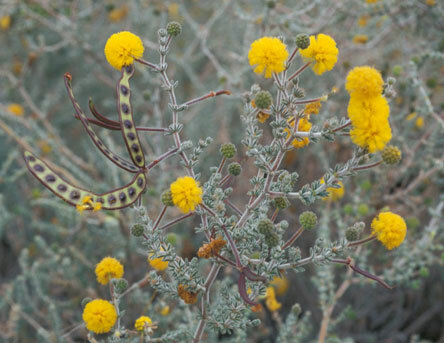 The Acacia Page on the ASGAP site provides information on the cultivation and propagation of Wattles, along with photographs of a few species, and more. Provides detailed information on about 100 commonly grown Australian Acacias. List of Registered Australian Native Cultivars. A few Acacia species are included on this list. Mount Annan Botanic Gardens – The Wattle Garden. 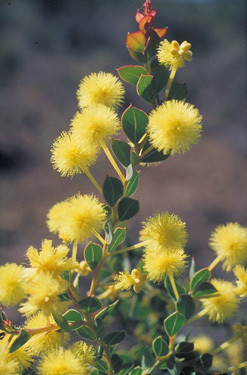 Information on the propagation of Wattles and a list of species recommended for growing in New South Wales is provided at the ‘WattleWeb’ site, part of ‘PlantNET’ (which is delivered by the Royal Botanic Gardens Sydney). A spectacular red flower variant of A. leprosa. Information of seed pre-treatment techniques is provided for a few Acacia species. Provides detailed information on a number of commonly cultivated Australian Acacias. An article by Abbie Thomas (Australian Broadcasting Corporation) includes a short list of Winter flowering Wattles, and other information.